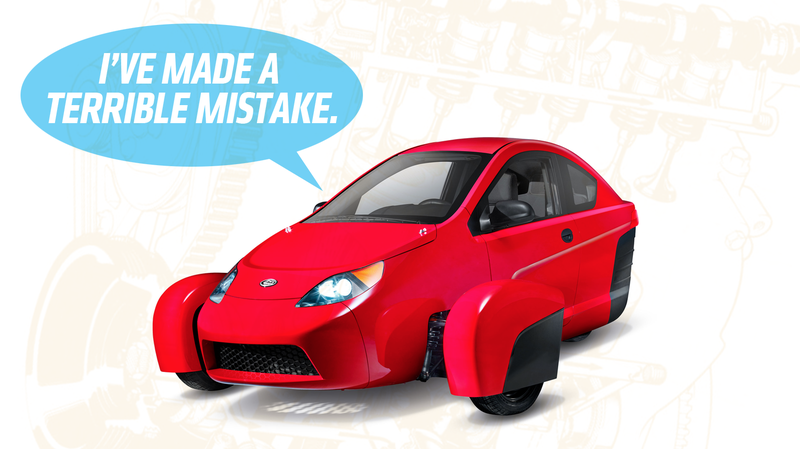 My biggest bafflement with Elio, the struggling startup that has been promising to make inexpensive three-wheeler cars that get “up to 84 mpg,” has always been with their choice of engines: They’re developing their own. At least they were, until, it seems, today, as a new press release is touting a partnership with a “Fortune 500 OEM” to provide the still-nonexistent three-wheeler’s potential. What the press release doesn’t mention is how much time and money Elio pissed away trying to develop their own powerplant. Really, the engine Elio was developing wasn’t even their own, original design, which just makes the whole situation even sadder. It was to be a modification of the engine from the Geo Metro/Suzuki Swift, a 1-liter inline-three known as the G10. This isn’t a secret; Elio describes the engine in similar terms on their own website, as far back as 2014, where they also make the case for why it’s so crucial that they develop their own custom engine. It’s a pretty nice motor, but as we gunned down that path, we realized the technology has improved dramatically in 20 years. If we were to put the Geo Metro motor in the Elio, we’d get 66 miles per gallon highway, but by updating it, we’d get 84, and we’re not taking any technical risk. At the risk of sounding like a jerk, I have to say that I always thought Elio developing their own engine was a bad move. Established low-volume car companies like Lotus and Morgan understand that it doesn’t always make sense to develop a whole new engine, and Elio certainly had good engine options to pick from. Back in 2015, I wrote an article for Boing Boing explaining all of this, and suggested a few possible engines that Elio could use, including Ford’s 1-liter inline-3 Ecoboost engine. ...it seems likely that the OEM in question is Ford, since Roush works notably (but not exclusively, commenters have reminded me) with Ford products. I suspect the engine in question is Ford’s 1-liter EcoBoost. Still, it could be other small-displacement engines. What the press release doesn’t overtly say, unsurprisingly, is that Elio effectively pissed away most of the money it had attempting to fruitlessly re-develop an engine for no good reason. Elio’s independent engine development project was the biggest anchor weighing them down, and while it’s good to see that this has finally been acknowledged and, hopefully, corrected, it could be too little and too late for Elio. This is the best engineering decision Elio could make, but one they should have made from the very beginning. They’re already four years late on their initial promises of car deliveries, and while this new plan is much more likely to result in a drivable car, there’s still so, so many other factors that I’m not ready to give Elio my vote of confidence just yet. What I can give them, however, is a crisp, refreshing I Told You So, and maybe a small fountain drink.